Successfully Added USB Flash Drive (8 GB Key-Shaped Edition) to your Shopping Cart. 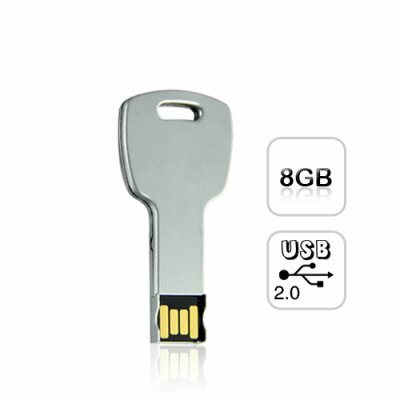 8 GB Key-Shaped USB Flash Drive from Chinavasion is a uniquely designed, smart looking and functionally reliable USB storage gadget that can be used with both PC and Macs. With thickness of only 3 mm, this should be called "The World's Thinnest USB Storage Device"! At same size to your normal keys, you can easily attach it to your keyring or leave in your pocket without even feeling it. It is so small and thin, but what about the quality? Please do not worry, this Key-Shaped USB Flash Drive is virtually indestructible by using tough and scratch-free metal casing for extra durability and data security. This 8 GB USB Flash Drive has enough memory for literally thousands of photos, hours and hours of video, or thousands of MP3's. With its High Speed USB 2.0 Interface, you can also use this USB flash drive for transferring files from one computer to another or even as a long term data storage device. This 8 GB Key-Shaped USB Flash Drive is in stock right now, and at our famous China Wholesale Price. Order in bulk now and make a handsome resale profit, or buy a few for yourself and your friends as great gift. Brought to you by the leader in wholesale electronics - Chinavasion. Could be called "World's Thinnest USB Flash Drive"
Can I key cut this USB Flash Drive so it can open my front door? Not yet, but we are currently working with manufacturers in China to turn this feature into reality. While the metal shell of our 8 GB Key-Shaped USB Flash Drive is virtually indestructible, the average life cycle of the internal storage memory is 10,000 write cycles. Is this USB Flash Drive as tough and secure as IronKey? Yes, but only at 1/3 of the price of IronKey and impossible to self-destruct.